Operated by the Croft Institute, the major in international studies is an interdisciplinary program in the College of Liberal Arts at the University of Mississippi. It focuses on the connections between politics, economics, and culture at the international level, providing students with an understanding of how the contemporary world works and with the tools to succeed in it. Students in the major are exposed to a curriculum that includes microeconomics and macroeconomics as well as broad surveys of East Asia, Latin America, Europe, and the Middle East at the lower-division level and a wide variety of more specialized topics on the upper-division level, such as the war on drugs in Latin America, globalization and religion in East Asia, the development and significance of the European Union, and revolutions in the Middle East. Students might also study the role of poverty, gender, and ethnicity in international politics, economic dependency and underdevelopment, energy policy, international trade, the challenges of national security in an age of globalization, and many other issues that affect our world today. Students develop both qualitative and quantitative skills: they hone their writing ability and learn to make statistical analyses. Most Croft courses are taught in small classes by the Institute's professors. These small classes foster discussion, reflection and analysis. Other courses taught by the larger community of the faculty in the University can also count for the major, giving Croft students a wide variety of choices. International studies majors are required to specialize in a foreign language and study abroad for at least one semester in a country where that language is spoken. The goal is for the Croft graduate to become fluent in his or her chosen language. To reach the high level of proficiency expected of International Studies majors, Croft students take foreign-language courses every semester they are enrolled at the University. Truly mastering a foreign language takes time, but it is very rewarding. The Croft Institute works closely with the University of Mississippi's Department of Modern Languages to ensure that its students receive high-quality, oral proficiency-oriented language instruction. When they graduate, Croft students are able to live, study, and do business in their chosen language. To measure their language skills, Croft seniors take an Oral Proficiency Interview-- an independent test developed by the American Council of Teachers of Foreign Language -- the semester immediately prior to graduation. Students' OPI scores serve as additional proof of their ability to operate on the global stage. Croft students are required to study abroad, for either a semester or a whole year, in a country whose language they have been studying. In addition to studying the language itself, students can also take courses abroad that count for the regional and thematic requirements of the major. The semester or year spent abroad is typically the highlight of a student's undergraduate career. It is the experience of a lifetime, a time of intense personal and intellectual growth. Specially designed intercultural communications courses help students prepare for their time abroad and adjust to being back. All international studies majors complete a two-semester senior thesis. They work closely with a faculty mentor to plan and carry out a substantial research project and produce a scholarly paper. The senior thesis is the culmination of an undergraduate career: it brings together all the skills students have developed in their other courses and it lays the groundwork for future success. 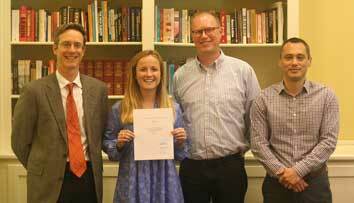 Margaret Cartner, after defending her senior thesis Spring 2017, with her thesis advisors. 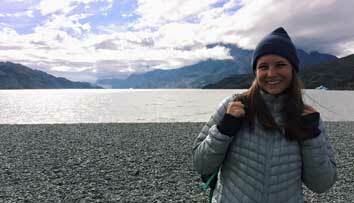 Spring 2017 - A Croft student visiting Lago Grey Torres del Paine National Park in Patagonia, Chile. *Croft students typically select a regional concentration and foreign language before starting their first semester in the program. The thematic concentration is selected no later than the second semester of the sophomore year. Croft students must maintain a cumulative, resident GPA of 3.0 or higher to remain in the international studies major past their sophomore year. 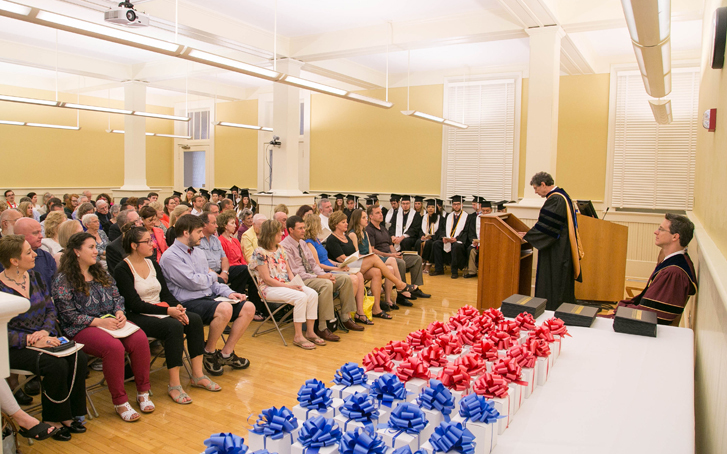 The resident GPA includes all courses a student takes at the University of Mississippi.